Hi, i’ve just purchased and es-6 and i would like to know if everything’s ok with my device. I apologize about opening a new thread in the forum since my initial doubt was referred mainly to dc offset on channel 1,2,3,4,5,6.
how is it possibile that on ADAT 7, there’s a copy of ADAT 1 + some white noise/crackle? But the weirdest thing is that noise suddenly disappear as i...blow into my case. I imagine your ADAT 7/8 channels are picking up noise, since they're not connected to an ES-7 expander. Do you happen to have a jumper link spare? We could test that theory. Actually i have the es-3 and es-6. Adat 8 is not picking up anything while on Adat 7 i can hear some noise/crakle. As i plug something on my 1st channel of es-6, i can hear the same signal/audio on Adat 7 but still with occasionally noise/crackling. Honestly i could easily ignore this if you tell me that could be something related to a “missing” es-7. Yes i do have spare jumpers. I think I'll start shipping them that way. Same issue, I will give this a try too. I also notice that my ADAT chanels seem to be showing a signal, noise floor, although they don't seem to be that noisy, the channel meters are definitely showing noise. I'm using a UAD Apollo 8 & 8P for ADAT. That will be DC offsets that you're seeing, not noise. to avoid opening a new thread, a question about DC offset from ES-6..
so i recorded a jam session recently, and to get some extra audio inputs beside my RME, i resorted to ES-6 inputs. and of course the tracks and channel meters show the DC offset. so far so good, but what confuses me (and i admit i may have overlooked something) i tried to rid of it by "remove DC offset" audio processing command in Cubase, and nothing happened. then i tried to apply a sharp HPF beneath 20Hz on that channel, and again the DC offset is still present on the channel meters. nothing happened. i lift the PHF up to 500 Hz, the sound thins out, yet DC offset is still there. confused, how can this be? 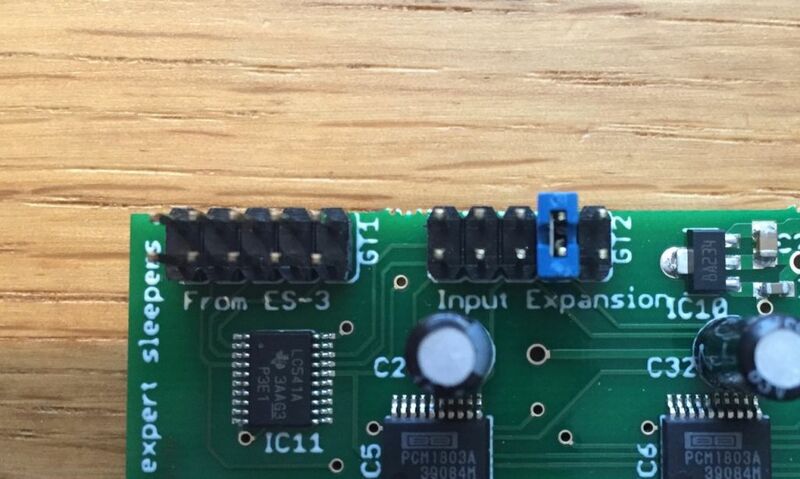 also a side question, since my tech is smt literate is it possible to add a DC blocking cap to 2 of the 6 inputs on the ES-6? if i were to, hypothetically, say 4 cv inputs is enough but would like to use two as dedicated audio inputs? You could probably just add some capacitors on an ES-6 mk2. On the mk1 you'd need to add some resistors too. Re. the offsets, it sounds like you're looking at the meters for the signal before the processing is applied. In my case the DC offset is different on different channels. From -36db to -54db. With the DC offset correction applied in the Utility plugin in Ableton it drops to a respectable -84. I've tried the fix suggested above, i.e. I wired the jumper on my ES-6 as shown and that didn't fix the issue. ES-6 mk2 connected to ES-3 mk3, ADAT connections to Audient ID22. My power supply is Trogotronic m15, running at less than 30% capacity. I've tried Eowave Source D'Energie before and the DC offset is pretty much the same using either power supply in two different locations. What issue are you still experiencing now? I just received my es6 which is connected to my es3, then everything connected to my fireface uc. I see the same problem that Strangeattraction has encountered; in his post of December 13, 2018. In the same way, the problem is partly settled with a Utility. Nevertheless, I will want to know if there is a problem with the module. DC offsets are expected on the ES-6 inputs. For audio use, a DC-blocking filter can be applied which will completely remove them. I have a issue that is somewhat related to this (can't start a new thread so posting it here). I'm using the ES-6 inputs as an audio inputs to my DAW. This works like it should except for the fact that the audio levels are different for each input. 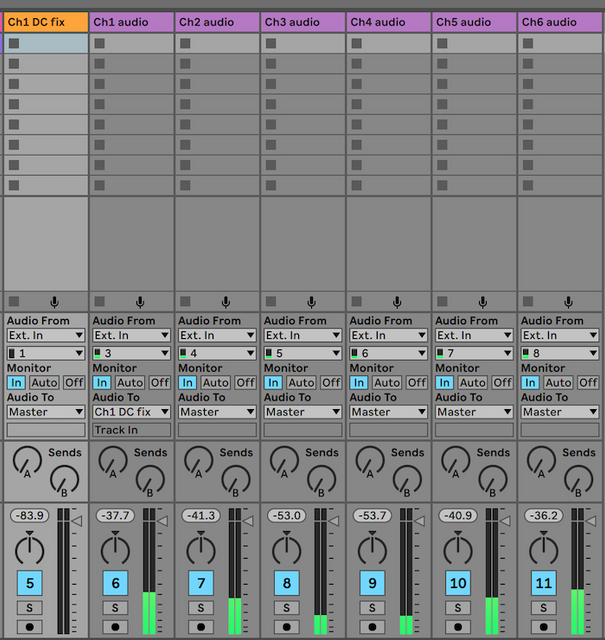 If I, for example, sent the same signal to each of the six inputs, I get values that look something like this in my DAW. Small differences are not really a problem but especially input 4 that's at -28db is a bit problematic. Because if I boost this signal a lot to bring it up to about -6db it starts distorting. Any idea's what might be happening here? The DC offsets might be throwing it off a bit. Try measuring/recording the signal after applying a DC-blocking or high pass filter. Tried it today (with a HP Filter) but I'm getting the same results/db differences. Then that sounds like it might be a fault, on channel 4 at least, if you can rule out any misconfiguration of your software or audio interface.